1261 is yet another Country Fair corked canister. 115mm top od, 128 bottom od, 95 high. Haven't seen this one in Cordon yet but wouldn't be surprised, as many were. 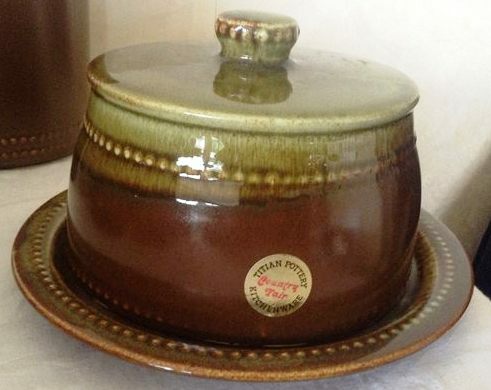 They made about 26 different shapes in the Country Fair range and these were first made in 1978. I have 4 different canisters, pepper, salt and vinegar jug, salt pig, round and rectangular butter/cheese keeps (2 parts each), and ramekin. Don't have hanging salt pig as seen in Val's blog, large canisters (2 sizes I think, v expensive on tm), other jugs (3 sizes I think), cup, large or small teapot, or vase (?? Val's blog). Can you think of any others? Do the tops and bases of keeps count as one or two shapes? 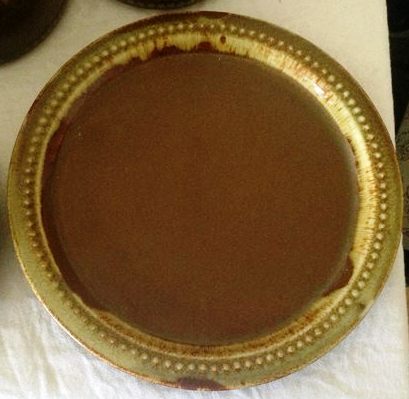 There is a round platter and a rounded rectangle platter or dish, soup bowls, large dome lid thing. 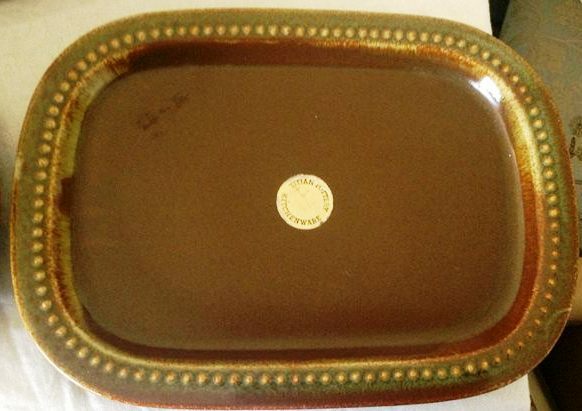 I'm guessing the "round platter and a rounded rectangle platter or dish" are the bases for the cheese and butter keeps respectively and the "large dome lid thing" is the cover for the cheese keep, which is illustrated by Val in her blog. There is a similar rectangular cover for the butter keep. There are no numbers on any of those four items. Also, I presume where I have said "ramekin" and you have said "soup bowl" we are both talking about the single-handled-bowl numbered 1272. Or is there a lugged bowl as well? Unfortunately only the 6048 has a picture in the gallery, and I am still embarrassed in that department. I will persevere with this product line and hopefully, in the future, be able to provide numbers and pics for many Country Fair shapes for the gallery. I actually have a box of it in storage I will get it out next week, and share photos. There's about 20 pieces most with their original stickers on them. There is an advert at the Museum library and it includes the whole range of Country Fair which is rather stunning and there is a Charger/Large Platter that I can't find the number for yet and I've never seen any in real life. Here is the Country Fair range from the Crown Lynn records and yes lids have their own number as they are a different shape. I don't think the following are in the gallery, feel free to pop them up, Ev. the only one of these that is numbered is the jug. The number is very hard to read could be 6055? I can't take any good photos at night but, I do have a couple of more I'll add tomorrow. Hey Ev, I noticed you don't have shape 1325 on your cf list but it is in the gallery. Thanks bop, as there is no way that I can read that shape in the records because it's so faint it's almost not there. I guess it's a sugar bowl? Yes I thought sugar bowl as well. There are still around 10 shapes to find in the Country Fair range. See the list on the first page of this thread. Unfortunately this auction is just way too big and badly timed for me at the moment. 1310 cup: I think Val might have this. 1272 oblong butter cover I have. 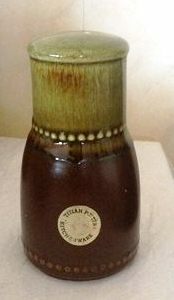 6049 vinegar jug I have. 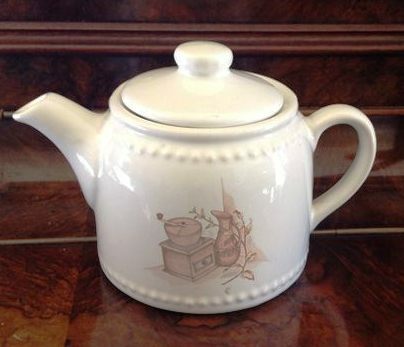 1354 and 1355 teapot and lid I hope to have soon. 1404 teapot, I think is Val's teapot. 6058 cream jug I think bopmum has provided. according to the seller Val has this too. I'll keep working at it but don't fancy my chances with the bowls. It's a beauty isn't it !! The 1325 sits between the 1261 "small canister" (like 1262 but shorter, not in gallery) and the 1268 "jam pot" in outside diameter (5in, 4in, 3 1/2in), but is lower than both (3 1/2, 3; 2 3/4) and even shorter than the 1275 "spice or mustard" (also 3 inches high). It is essentially the same profile as the other three, with no lid lip so I guess a cork would be an appropriate cover. The proportions would suggest that it is indeed a sugar bowl, as your notes indicate, rather than a storage jar, and may be a match in diameter for the 6048 "kitchen jug" or 6056 "milk jug", which I do not have to measure. 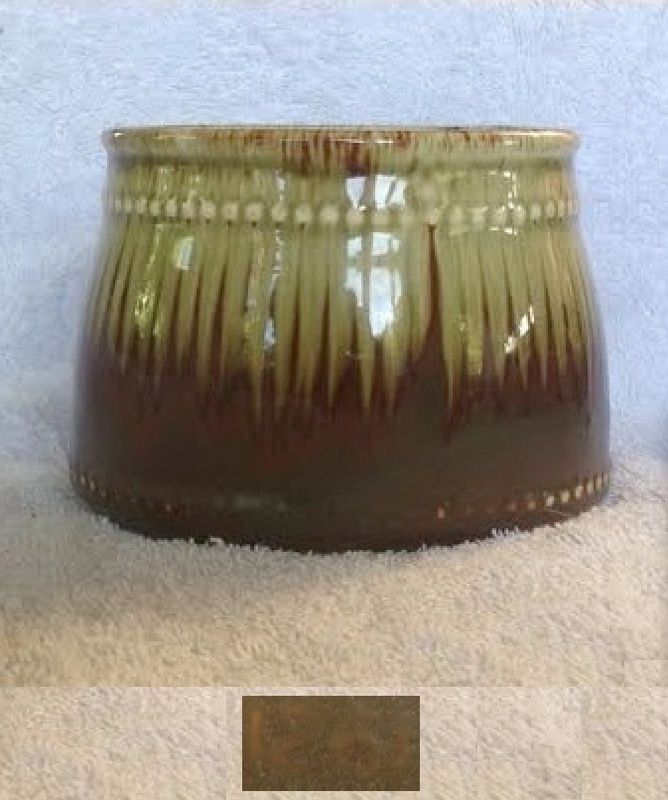 The 6058 "cream jug" is the same diameter as the 1268 "Jam Pot". As I have neither of the larger jugs I will use the cream jug for serving milk, and the jam pot as a sugar bowl. I dare not put these in the frig so even if I acquire larger jugs they will only ever be used for serving. Now that I have the 5058 and 1325 in front of me I am pleased to say they are as bright and crisp in colour as bopmum's photos. I'm guessing they haven't seen too much bright light. I get to collect my 1354 "Teapot" on Saturday. It has the evil orange and metallic black glaze, but should still sit well with creamer and jam pot as a tea set. The seller belatedly indicated a possible crack and offered a price reduction, but I'm hoping it's just a factory defect. I agree the 1404 (above) is lovely, and admit the 1345 looks a bit bloated but as a 6-cup pot it is much more useful. Also, pottery it made to keep food hot, or to keep food cool .... it's a natural product for doing that, so I'm surprised that you don't put pottery jugs in the fridge ...... ??????? On colour: Just guessing. No scientific backup. This stuff is getting pretty old. I just thought prolonged exposure to UV may have had some effect. Although there is some colour variation within all my Country Fair, most of the pieces I got from bopmum are distinctly brighter than the rest. I do not know the composition of the clear or coloured glazes but I know that in some glass where manganese is added to increase optical purity at time of production prolonged exposure turns the clear to purple. Some smart people have even exploited that by totally purpling clear lightshades. I know that generally the colours on an oil painting are regarded as permanent, but water-colours are not supposed to be hung in direct sunlight. Art galleries generally avoid hanging any paintings in direct sunlight. On refrigeration: Where pottery is already crazed I am reluctant to keep liquids in it for prolonged times. 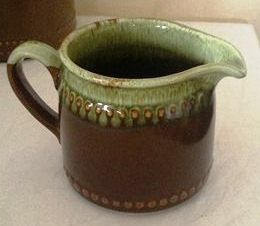 I have a Temuka milk jug, the pale grey glaze from the 1990s I think, that I use regularly for a milk jug. I noticed after a while that it had developed a discoloured waistline after prolonged refrigeration. This jug is not even crazed. 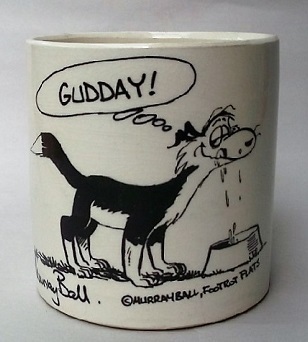 Not all pottery is made to take extremes of temperature, hot or cold. I crazed my first Fleurette tulip cup with hot coffee, just like that, so I've taken to being cautious. I like to wash dishes in scalding water but tend to reduce the temperature for items I think might craze. Even with Cook & Serve bakeware I take care to avoid rapid changes of temperature. Years ago I pinged a couple with direct exposure to flame. When adding cold (room temp) liquids to a casserole (Cook & Serve) I stir in slowly. If I have leftovers in a Cook & Serve casserole in the frig I let stand for a while before putting in the oven. Different material I know, but same principle: I carelessly pinged a glass blender jug just recently rinsing with milk from the frig after blending a hot pumpkin soup. I felt very stupid because I should have known better. And although designed for frig use and cheap at five dollars my McAlpine jug is staying on the shelf, empty.